For anyone who loves radio, the Internet is like a giant playground. No matter what your taste, whether it’s music, talking, regional radio, national or absolutely obscure, it’s all available, broadcast live on the Internet and available on your computer. Radio stations have been quick to embrace the Internet as a way of reaching more listeners from around the globe, and in some cases it’s been very successful. Others see it as a way to consolidate their local base, drawing in those who might listen on office computers, for instance. Much like the Internet itself, Internet radio is a recent phenomenon, and one that really only became viable with the widespread uptake of high-speed broadband connections, since before that it was impossible for people to receive broadcasts properly. More radio stations came online around the globe, but the technology also gave rise to a huge number of amateur stations that could broadcast for free on the Internet via a number of portals. They were, in general, a little different, with a limited playlist that was set on a loop. A few, though, used talk and broadcast live. However, with changes in the royalty rates payable for music broadcast on the Internet, the vast majority of these have fallen by the wayside. Compared to other areas of the Internet, radio seems to get very little attention, but it’s been a growing movement, simply because of the range it offers. More recently, the credit crunch has forced a few stations to abandon their Internet ventures, but there’s still an awful lot out there – more than you could really listen to in a lifetime. If you’re abroad, you can simply fire up your laptop using a wireless connection and catch up with the BBC or your local radio station if you want. Unless you have a broadband connection, be it DSL, cable or satellite, there’s no point even trying to receive Internet radio. However, if you do, simply type “Internet Radio Listings” into your search engine, and the results will offer you a wide range of possibilities from all over the world. From there it’s pretty much like a lucky dip. Simply try something and see how you like it. If you don’t, move on to another station. The only guarantee is that you’ll never run out of possibilities. There are also music sites that function like radio stations, allowing you to programme music you like, and they will play it and offer other suggestions you might enjoy, and you can play all this on your computer. That’s good, but the real joy of Internet radio is experimentation, in finding something you’ve never heard from across the world, whether it’s music or a broadcast in a foreign language. You’ll inevitably find some favourites, and maybe develop a taste for, say, Brazilian samba. Bookmark the stations you enjoy most to return to them often. 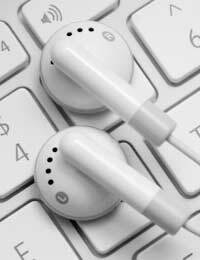 An even newer phenomenon than Internet Radio is the podcast. This is a broadcast, or at least a portion of a show, that’s been recorded and is made available for download. So, if it’s something you wanted to hear, but couldn’t catch live, you can download it and listen later either on your computer or on an MP3 player (podcasts are in the MP3 format).